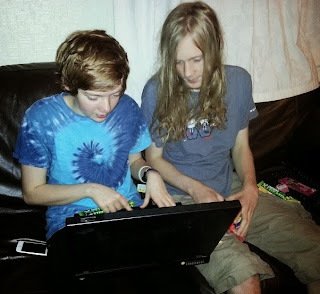 My teenagers were given the task to review a new computer app. the Chewits Cool Crazy Carnival for age 13+ and they've been sent an amazing box full of Chewits sweets to try while they do so! The very very best thing about all of these Chewits sweets, aside from the taste, and the chewiness obviously, is that they're ALL vegetarian, which means for just about the first time ever, all of my children can have equal share and no-one has to 'make do' or find something else. 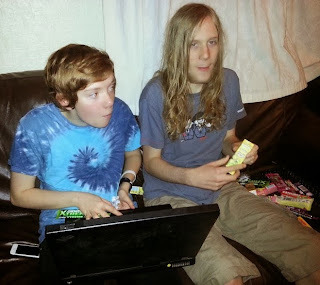 My teenagers were a bit put off by the 'Carnival' initially as they didn't know what was going to happen and they had to either fill in the form, or connect to Facebook. They're dubious of 'spamming' and didn't want to post loads of Facebook status they had no control over, alternatively the form option asks for your school name, which in our house they're banned from sharing. I told them they could just put 'school' and after that initial hiccup, they were off. The app only works on a computer, it isn't able to work on a mobile yet, which meant they ended up taking turns. My 13 year old girl played with the 'Carnival' for longest and she really enjoyed taking the faces of her 2 best friends and installing them onto cartoon bodies so that they could visit the carnival with her. I tried the app myself and connected via Facebook, choosing to share 'only me'. The app did share 5 stills from the Carnival, which is a little excessive, but they had the faces of my 2 chosen friends on cartoon bodies, so they were quite amusing. Because I'd connected to Facebook my latest status update, birthday and school name also appeared in the carnival, as well as bits of other information which were quite funny - I especially liked the 'I love Euan' on the back of my character's bag, as that's my partner! There is all sorts of information about Chewits here, photo's from 'Treat Truck' travels, information about sports courses and plenty of space for you to have your say. 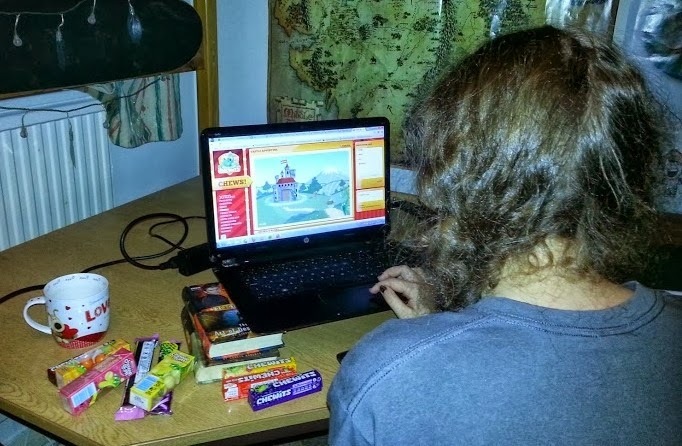 There are 5 games to play too - Mystic Chewie, The Claw, Castle Adventure, Spaceship Adventure and Taste Adventure. Mystic Chewie is an animated fortune teller. You choose a subject and are given a one sentence fortune in return. For example choose 'Flavour' and you might get this is reply - "Chewie sees your favourite flavour to be Fruit Salad because you are so fruity and fun!" The 3 Adventures games are 'point and click' puzzles. These puzzles are okay, some of it is very logical (e.g. try the key in the lock) but some is a bit random and very much open to chance and searching around the page for clickable items. The Chewits Claw is the big game. You can actually compete to win prizes including an iPod Touch. It's based on the claw machines where you grab at toys and try to lift them up and you have to be very precise with where you place your claw or you score! Points are gained by collecting Chewits. You can get extra points by filling up the bars on the right and collecting specific amounts of particular Chewits when asked. It's very simple and addictive in the same way as Tetris, but actually a bit more frustrating because once you get tired you simply can't get a good score at all and you need to walk away! My best score so far is a disappointing 18400, sadly massively beaten by my teenagers! 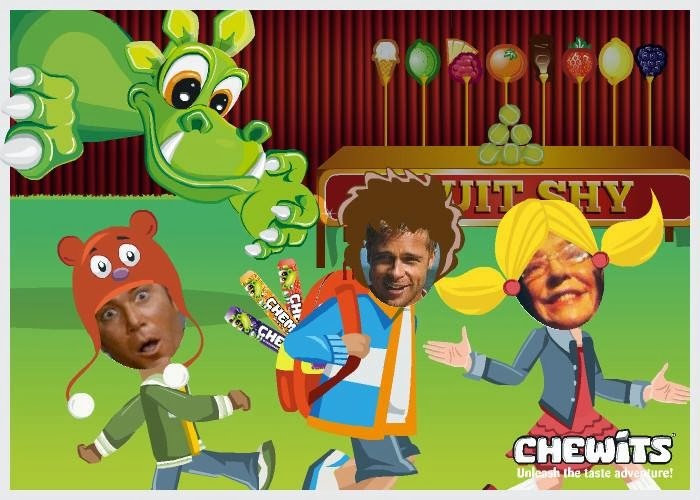 So what did they think of the Chewits Cool Crazy Carnival? I like the heads, they're funny. I don't understand why I had to put all that information in? The Claw is a bit hard to get in the right place. Overall it got the 'thumbs up' from my lot. They all messed around with it a bit and completed at least one of the 'Adventures', and at least 2 have returned to try and better their best scores. 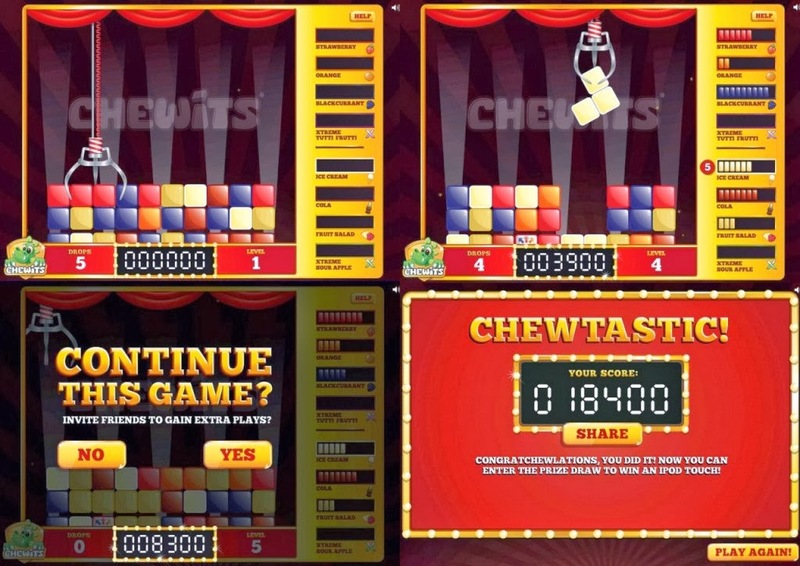 The website can be a bit glitchy and asks for upgrades to Flash that aren't helpful sometimes when you play 'The Claw' or 'Mystic Chewie', but these games can be played directly through Facebook from the Chewits page with no issue anyway. Plenty of good harmless fun! 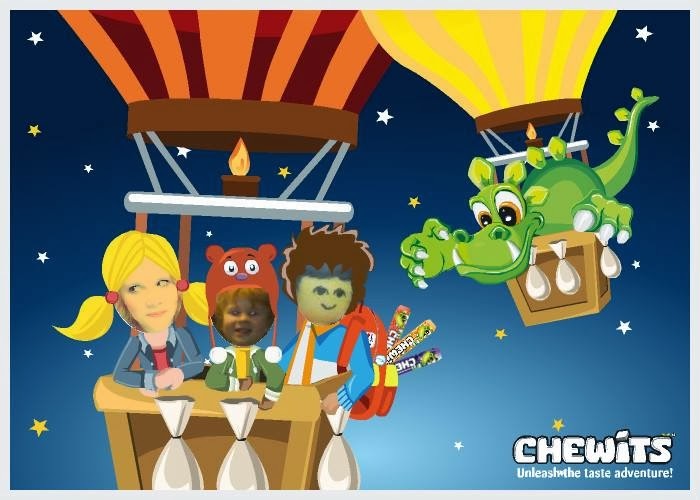 We were sent a box of Chewits and will be given a Theme Park ticket for the teenagers in return for reviewing this app. It's nice to see a game like this for older children. 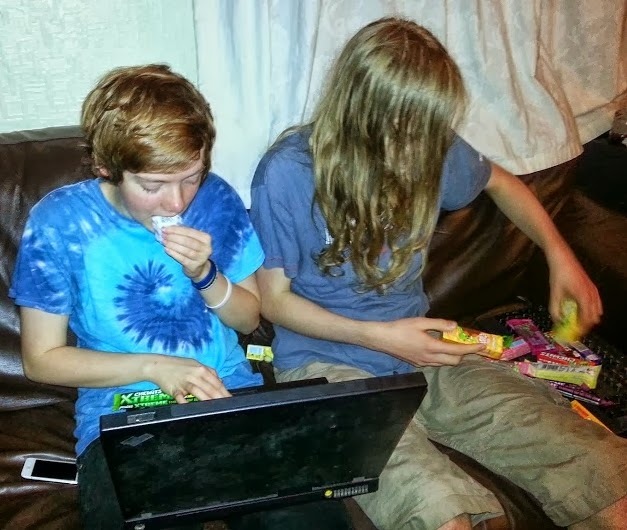 I'm very jealous they got all of those chewits too! Yum! They keep begging me for more Chewits from the box! I'm not sure if it's a good or a bad thing! Does seem sad that they want so much information and access to so much information, which they are then sharing - as it sounds great otherwise. The information is not shared via the photo's, it's simply shown to you (and you only) within the game. I think if they stated that before you start then it would never seem so intimidating. great review from them! I might go and look at the claw thing to see if i can win something! look like fun! i love to eat chewits! So do I - but they're eating them all! Loved reading your review! We just reviewed this app too and had the same reservations about putting friends' details in. I would like an option not to do this, but then I am pretty anti-social anyway. Did any of your packets of Chewits turn out to be one long Chewit? We had two like that, it was very exciting.